I was talking and praying with my friends Dave and Peggy today and we were talking about what we see happening around us in the christian community, some of the struggles we're facing, some of the road blocks we see and how we move forward in that, how we can bring change and life. While they were praying about this I kept getting a picture of brick walls around me, like the brick walls from the old maze screen saver that my first computer had. Hi-tech graphics those were, at first I thought it was in the old Doom game but it wasn't that elaborate. Anyway, I was walking through the maze as Dave prayed about working through frustrations and getting to what God has at the end of that. I was asking God how to get rid of all these walls, why isn't the path easier. And surprisingly (to me at least) he said, I made the walls, I put them there for you, to keep you on my path. It's not easy, sometimes there are dead ends but just turn around and go the other way. The walls are not there to stop you, they are just to keep you on my path. The prize is waiting at the end of this maze. I am employed by a church. If you've never been in that situation let me tell you (and this isn't to bash the church) sometimes it can be frustrating, some times it can be so slow. Sometimes I don't' know why God has me there at all, but I am sure it's part of his plan. Do you feel like you are stuck in a maze right now? Do you wonder why you are doing the things you are doing? If you are on a path with God, chances are he will ask you to do things that do not make sense to you. It seems like everywhere I turn there is a wall - board meetings, budget issues, family issues, theology issues, people issues - walls that seem to keep things moving forward, keep new life from flowing out of the church. And I can never figure out why. Today the Lord showed me that even the walls are part of his plan. He is the master designer and if we are looking for him we'll find the clues that help us navigate that maze. I think we give our enemy too much credit. Sometimes we think he puts the walls up, but I am not sure that is the case. You see he doesn't actually have any authority anymore, Jesus took it back on the cross. Maybe he can throw speed bumps in the way, or the occasional alien monster robot - in fact if you're looking for God, you'll probably get lots of those popping out from behind every corner - but the walls are there so you stay on the path, so you keep searching until you find the end of the level. Jesus never said the road was easy, but he doesn't give any credit or authority to the enemy either. If you feel like you're stuck in the maze, what ever your walls are, whatever your monsters are, God has designed the whole thing. Maybe your path looks different than your neighbors, or your brothers. Maybe your church looks different than your parent's. That's OK. The walls are not meant to contain us or lock us in, they are to keep you on the path. Here's the coolest part. Remember all those "cheat codes" you could get for games, well we've got access to all of them. a b a b up down right left right left select start, bam, unlimited life. Jesus has gone through the maze ahead of you, gotten the keys to death and brought them back for us. If you believe in the things he said and what he did on the cross, he gives you eternal. Bonus two, unlimited ammo, hold select, a a b b up down start. You get the Holy Spirit. He does all the hard stuff for you. Alien robot monster jumps out, bam, Holy Spirit gives you all the armour of God to help you defeat it and keep on trucking through your maze. I don't know who designed that old screen saver maze, but mine never ended. 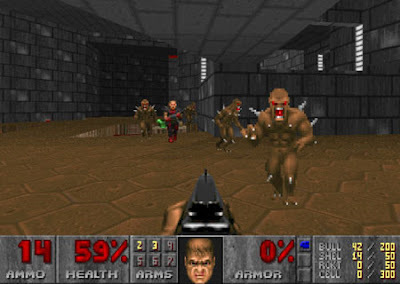 And I never got to the end of Doom so I don't what happens there. But I do know who designed the maze you are in, and he has a plan in mind and there is a ending. I know its hard to believe sometimes, I know it seems to be taking forever. But He built the whole thing, and he'll give you what you need to get through the other side if you'll ask him. His cheat code seems to be less complicated, "ask and you will receive, knock and the door will be open" somewhere in your maze, there will be a door that you just have to knock on and he will open it.